I dont have as big of a portfolio as you - from most of 2017 I was invested in 2-3 darwins and in 2018 I am in 10 give or take atm and I certainly cannot give advice cause you simply are more knowledgeable at this subject. I can only share my random general thoughts/**observations**. 1) This low volatility market is hurting LVS,GTD and in general I am thinking of getting out of those kind of darwins and observe from the sidelines till US elections (but I probably wont). I wonder how many darwins of your portfolio are "that kind of darwins". Maybe reduce that amount if they do bad last couple of months? 4) DCD looks strong in current market conditions as is the other one of this trader that I am sure it had lower divergence last time I checked. Maybe switch if DCD divergence worsens? In last radio program Juan Colón has said that It is very close to launch a new investors school in Darwinex. ¿Tiene sentido que un trader con mil euros gestione 10 millones? Hablamos de la credibilidad colectiva de Darwinex y los traders proveedores de DARWINs, ante los inversores. It seems also that Darwinex has decided to manage with Darwinia what type of providers would like. They started with the limitation of divergence, and now It seems that they would like higher equities to attract bigger investors. The idea is to limit the reward of darwinia with a factor over the equity. Other ideas are to try to reward the providers who show transparency with investors and are active here in this community, giving more trust to the Darwinex market. LVS GTD ad NTI are very good darwins and also very different, different portfolios and different timeframes but they share the same bad DD in Q3 , this DD doesnt' make them similar if they are different. About SYO : I am investing darwins not trading them, if divergence will get too bad I will exit as I have done with ERQ. Because I have added FEG , IMO news trading is more affected by divergence, the fact that now we dont' have the problem doesn't mean that it wont' be so in the future. DCD : will be out if and when divergence will be worse than -1% , it is one of the best in my portfolio so far. Thanx but as you can see I have changed alexplesk with fifty-five , that seems to be a trader, hshuki seems to be a stockpicker. Nice a decent trader is hard to find in etoro! I will keep an eye on him! 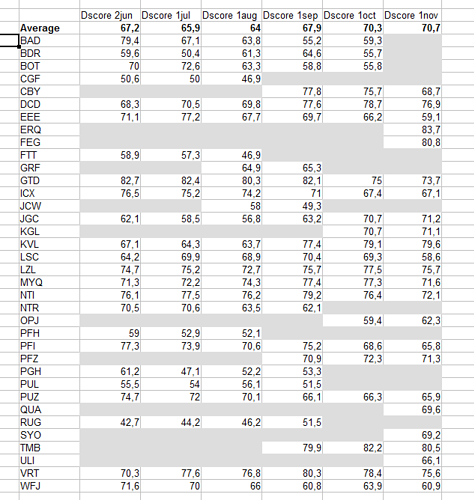 Darwinex says we have to invest darwins with a DScore >68 , I agree . The problem is that many darwins that were above 70 at the beginning of 2018 now are below 60 , some of them even below 50 . It is clear that also as buy&hold investor I need an exit strategy. I have to thank @NemesisCraze and @GAlbano76 for their studies on this sublject but that was a work I was expecting from @DarwinexLabs . Let's hope to recover at least 4% by the end of the year. Yes I have it but at the moment it is useless, custom dates is nesessary to combine darwins with different lenght of trackrecord. I am interested in combining performance of the recent part. It wasn't a compliment to myself as trader, more a warning for my bad result as investor! The first reaction for this result is disappointment. 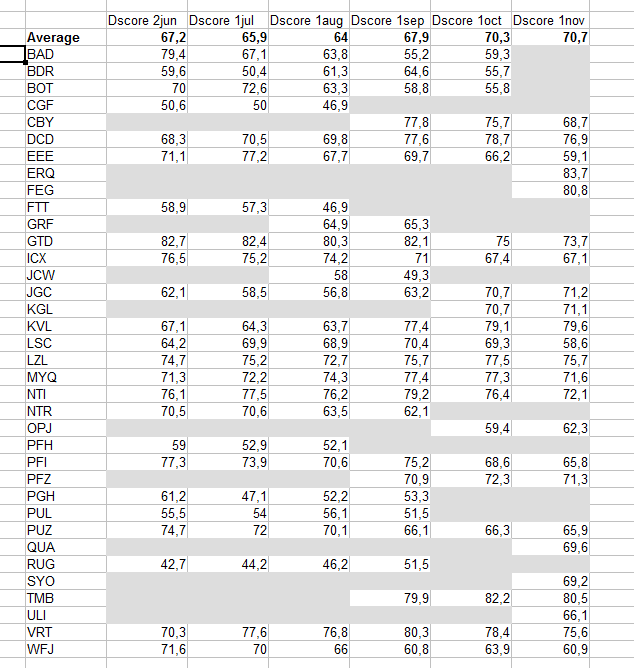 But thinking better I am happy about the structure of my portfolio, represented by the high average DScore. Let's hope for a better November and December. I understand, my last expression was also a greeting for a better overall future result, but credit where credit is due..
Why don't you invest only your darwins? It would be a defeat as investor and I committed a lot of time in this project. The hard reality is that spotting robustness is very difficult. It is already difficult when we have 100% knowledge of a strategy because we developed it. Spotting robustness in the work of the others is even more difficult. I thought you had sold BAD. Am I mistaken? To be honest current results (mine but especially yours and others - cause you are way more experienced in identifying good darwins) are dissapointing. Yes it has been sold , as you can see by the grey square in the table. The exit strategy below 55 is in place since the beginning of October. A rare gem from eToro. This TradeBetter knows what he is doing.